9ct White Gold Tanzanite and Diamond Trilogy Bangle — Form Bespoke Jewellers Ltd.
A white gold trilogy bangle with tanzanite and diamond. A trilogy of beautiful stones is at the heart of this contemporary bangle design: two matching round brilliant cut diamonds and a round brilliant cut tanzanite. Each stone has been rub set in white gold for a neat, tactile finish. 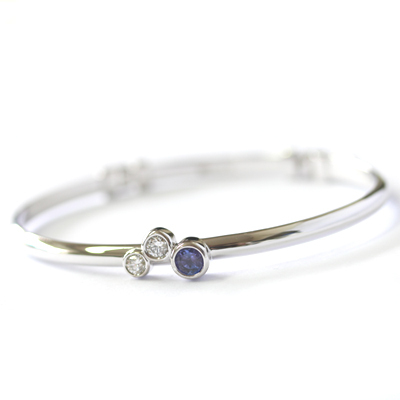 The diamonds and tanzanite sit on a bespoke made, white gold bangle with a pretty opening clasp. 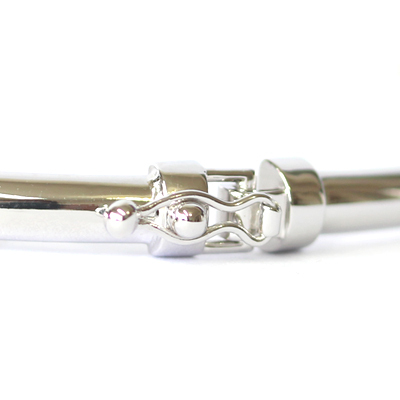 The bangle was hand finished, polished and set in our Chapel Allerton workshop, in Leeds, Yorkshire. A cool, contemporary and colourful bangle.